^ Duties & Functions Secretaries of the Treasury. 美國財政部網站. （原始内容存档于2010-11-19）. Secretaries of the Treasury. History of the Treasury. 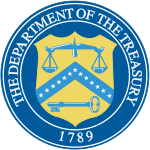 United States Department of the Treasury. [2006-04-09]. （原始内容存档于2006-05-16）.